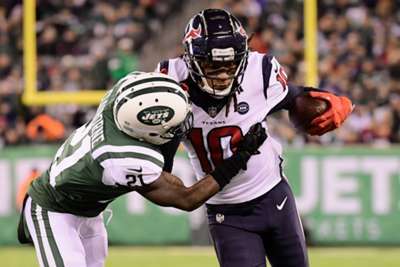 DeAndre Hopkins caught two touchdowns as the Houston Texans took a significant step towards clinching the AFC South title with a 29-22 road win over the New York Jets on Saturday. Houston led 16-3 at MetLife Stadium but were trailing with just over two minutes left as the Jets roared back, with quarterback Sam Darnold producing one of the best performances of his up-and-down rookie campaign. Yet Hopkins snagged a 14-yard pass from Deshaun Watson with 2:15 left and the Texans held on, moving to 10-4 and opening up a three-game lead at the top of their division. The Texans will now win the AFC South on Sunday if both the Indianapolis Colts and Tennessee Titans fail to win their respective games against the Dallas Cowboys and New York Giants. After Houston kicker Ka'imi Fairbairn slotted over two field goals either side of Jason Myers' three-point score for the Jets, Hopkins was the first to find the end zone midway through the second quarter when he adjusted to haul in a 45-yard bomb from Watson. Another Fairbairn field goal increased Houston's lead before Darnold showed some brilliant improvisation on a five-yard touchdown to Robby Anderson that made it 16-9 to the Texans at half-time. Myers missed the extra point there, and he failed again with a chance to level the contest in the third quarter after Darnold had thrown his second touchdown pass to Andre Roberts. Fairbairn's 49-yard field-goal attempt went over at the start of the fourth quarter, but the Jets had their first lead of the game when their offensive line helped Elijah McGuire rumble in for a two-yard rushing score. However, Hopkins, who would end up with 170 receiving yards from 10 catches, displayed strong hands to hold off Mo Claiborne and grab another touchdown pass from Watson, who completed 22 of his 28 passes for 294 yards. Fairbairn's fifth field goal of the night extended Houston's advantage and Darnold, who went 24-for-38 for 253 yards, was unable to lead a late rally for the Jets, who dropped to 4-10 with the defeat.